Must be made by contacting Indianapolis Marriott Downtown for reservations at 317.822.3500 or 800.228.9290. To ensure block rate, reference "Tri-State Office Manager & Accounting Meeting." 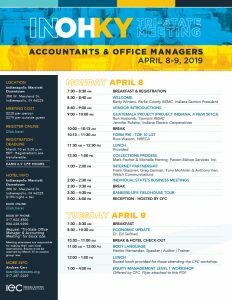 ROOM RESERVATION & MEETING REGISTRATION DEADLINE March 10, 2019 ROOM RATES $199 per night + tax https://book.passkey.com/go/tristateofficemanager2019 Check-in time is 4:00 p.m. and check-out time is 11:00 a.m. I will attend the tour of Bankers Life Fieldhouse. I will not attend the tour of Bankers Life Fieldhouse. Please plan to bring your photo ID. Location is at 125 S. Pennsylvania Street, Indianapolis, IN 46204. Additional tickets are available to purchase separately through Bankers Life Fieldhouse at bankerslifefieldhouse.com.